Death in Hollywood is always more interesting if it hints at murder, and The Ice Cream Blonde by Michelle Morgan does just that. 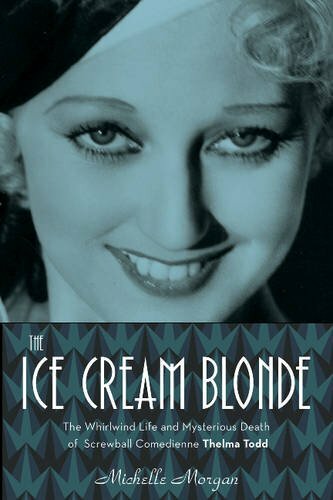 The Ice Cream Blonde introduces Thelma Todd as the victim of a disturbing death in a car in a garage. From that point, the book moves back to her birth and life as a young child. An attractive child who grew into a beautiful woman, it seemed that she was destined for fame . . . even if only for a short time. By all accounts, Thelma was a well-behaved and obedient child with loving parents who nonetheless set down strict rules for their daughter. But Thelma often showed an independent streak. Her original plan to be a schoolteacher did not last long once the modeling and acting bug bit. Thelma Todd graced the silent screen and was right there at the head of the line when the talkies arrived. She was one of the lucky ones to pass the “mike test” with a voice that did not drive producers and directors to distraction. Regardless, Todd never made it to the top rung of the Hollywood ladder, but built up a name for herself as a successful comedienne, often third in the billing, but one who continued to keep herself in front of the audience. Her goal to become a serious dramatic actress seemed always just out of her reach. Throughout the book, Morgan goes to great lengths to depict Thelma Todd as one of the nicest people in Hollywood. There are many quotes from people who admired and liked her for the many kindnesses she showed. “fellow employees would be afraid to tell Thelma how much they liked something she was wearing, as they knew she would immediately give it to them. Furs, jewels, expensive gowns—it didn’t matter what it was, if someone admired it, Thelma would gladly hand it over.” While there is nothing to disprove this, it takes some swallowing to believe it to be true. Morgan paints a picture of a fun-loving young woman who is more often than not out on the town with other starlets, and it’s hard to believe that there were not some untoward moments. While Morgan does spend some time on the other side of the coin—the affair with Roland West, a married man; involvement with gangsters who were interested in setting up a gambling parlor in her restaurant; a disastrous marriage; and numerous affairs that went nowhere, one gets the feeling that these are being glossed over and padded in order to not spoil the nice-girl image. Apparently not the “dumb blonde” of many of her roles, she invested money in a popular restaurant, Thelma Todd’s Sidewalk Café (aka Sidewalk Café; Thelma Todd’s Inn), where she applied the skills she learned as a schoolteacher to make the place successful. She goes into moderate detail on the accidental theory, but spends most of the time dispelling any possibility of accident. She debunks the suicide theory immediately. But she rolls up her sleeves when she gets to the murder theory, convincing herself, while she also tries to convince her audience that this is the only answer to an 80-year-old mystery. Morgan’s admiration for Todd notwithstanding, she does a good job of researching this story of Thelma Todd from her birth, through her life, to her early death. On the whole, this was a good read, especially for anyone interested in the heyday of Hollywood with all its dirty little secrets. Judith Reveal is an author of mysteries, historical fiction, and nonfiction. She wrote The Four Elements of Fiction: Character, Setting, Situation, and Theme.